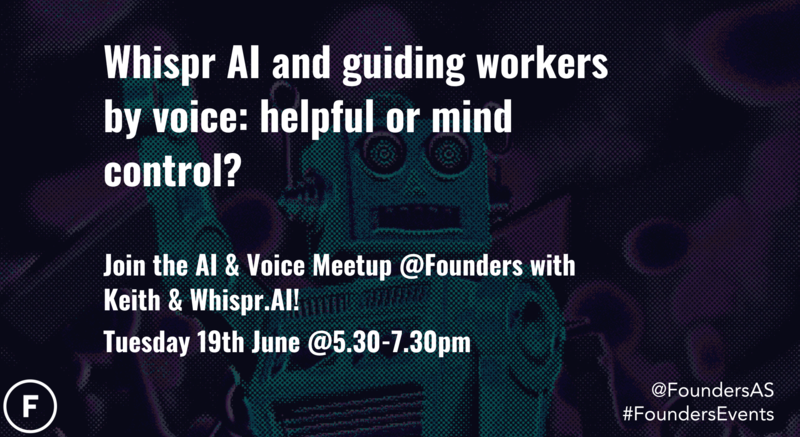 Come and learn about Whispr.AI at Founders. Whispr is a contextually aware "learn while doing" platform that aims to boost memory and accuracy rates for learning new tasks. Whispr works hands-free delivering content through a small hearable and listens to questions from users while learning a new task. Whispr.AI is founded by entrepreneur Keith Saft. Keith ran the IOT and M2M product development group for Telefonica, lead the product team for yahoo.com and the design and product team for Yahoo mobile. He also taught, for 6 years, interface design for Carnegie Mellon’s Computer Science department. He has 13 software patents. After having worked hard with AI you have a beer (or more) downtown with your AI fellows.The group is about informal meetings with other people interested in AI.The ideal members are people interested in AI who also like to meet other AI people downtown having a beer or perhaps another kind of drink.Join the group for having some fun and informal discussions on AI in the company of other AI people.Typical activities will be meeting somewhere downtown having something to drink (like beer) in the company of other AI people. Sound like something you want to help build? Keith is looking for a technical co-founder to build Whispr with him. Read more here.